Porter is a pretty ambiguous beer classification, varying greatly between producers and home-brewers. A porter will typically be brewed from roasted malt, resulting in a smooth ale dark in color. However, this beer style also has an interesting (and somewhat morbid) history. Porter reached the height of popularity during the Industrial Revolution in Britain. The style acquired its name from its proletariat following – the labourers and “porters”. The beer brewed at the time would likely have had a distinct smoky flavour which accentuates the roasted flavours of the malt. The potential growth of Brettanomyces yeasts during aging may also have added a distinct acidity to the flavour profile. 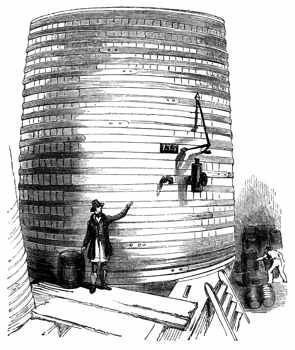 Once established as a lucrative commodity, brewers began to produce porter in such large quantities that massive vats were constructed to store and age the brew. The size of the vats was no small matter of pride, and sparked a vicious competition between brewers. The largest created in 1795 was large enough to hold up to 860,000 US gallons. Some were so large that more than 200 people could attend a dinner and dance within to celebrate the inauguration of such a vessel. The competition was ended by disaster in 1814 at a brewery owned by Richard Meux, one of the key players in the competition. A vat 6.7 metres in height holding 320,000 gallons of porter ruptured and . Eight people were killed and more injured by drowning, alcohol poisoning, and various injuries. Some were trampled to death by people stampeding through the streets to consume the beer. Harviestoun Engine Oil Porter is named for the British brewery’s founder Ken Brooker, an avid car enthusiast. The dominant flavours are smoke, chocolate, and a smooth molasses finish. The hops used are Galena and Worcester Fuggles, which add a slight licorice quality to the brew. The delicate smokiness makes this an excellent partner for rich stews and barbecue. Daniels, Ray (2000). Designing Great Beers: The authentic guide to brewing classic beer styles. Brewers Publications.